Responsibilities, relationships and recreation consume our waking hours forcing us to look for ways to make our days as hassle free and time efficient as possible. The Prodigio, the world’s first app-enabled Nespresso machine, promises to do just that, but does it deliver? This article clearly outlines the Nespresso Prodigio’s pros and cons, as well as its primary features, and then concludes with a frank evaluation. At which point, you will be able to answer that question for yourself. Design – The Prodigio weighs 2.9 kg and measures just a little over 25 cm tall, almost 12 cm wide, and 37 cm long when its water tank is positioned at the back. Nespresso insightfully designed the water tank to rotate from the back to either side which allows the Prodigio to fit comfortably in a variety of spaces. This compact machine comes in two colors, Titan and Silver, which easily complement any decor. Usability – Eric Favre, the Swiss engineer who invented Nespresso, envisioned a coffee machine that would allow anyone to make the world’s best espressos in their own home. The Prodigio fulfills that vision by requiring the user to perform only 4 simple tasks, namely load the coffee capsule, choose the desired size (25ml, 40ml or 110ml) and then place a cup on the drip tray before pushing the brew now or set schedule button. When requested to brew, the Prodigio heats up in 30 seconds and uses an amazing 19 bars of pressure to force the hot water through the ground coffee and then out as a rich, dark espresso with a generous layer of crema. Upkeep – The Prodigio is not only easy to use, but also practical to maintain. The 790ml water tank must be refilled and cleaned occasionally, but it detaches easily from the machine which facilitates these tasks. After running a brew cycle, the Prodigio drops the used coffee capsule into a container beneath the spout and about every 19 cycles, it will prompt you to empty the container. Finally to keep your Prodigio in tip-top condition, once a year you will need to descale the internal parts. Although that may sound like a chore, Nespresso provides envelopes of a descaling agent that you can simply mix with water and run through your machine twice, followed by two rinses with clear water. Bluetooth Technology – The Prodigio has conveniently marked buttons which can be used manually, but it also has the unprecedented ability to be paired with both iPhone and Android devices. 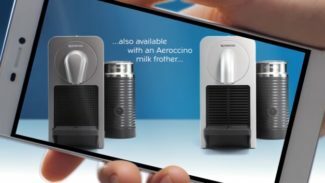 The Nespresso app which makes this possible allows the user to actuate the Prodigio and have it brew immediately or at a predetermined time. It also keeps you informed of the machine’s maintenance needs and will even manage your stock of coffee capsules, sending you an alert and helping your order when your stock is low. The Prodigio has many outstanding features, but like every machine it also has distinct advantages and disadvantages which are important to consider before purchasing. Simple to Use – Whether you are scheduling a brew from your smartphone or beginning a brew manually, there is nothing complicated about the Prodigio. Even its day-to-day maintenance and yearly cleaning are straightforward, and if you would encounter a complication, Nespresso offers a variety of assistance videos on their website which will walk you through it. Great Flavor – Nespresso’s Prodigio uses Grand Cru coffee capsules to provide high-quality espressos. The coffee capsules contain carefully selected beans from around the world and provide you with flavors that will rise to any occasion and satisfy any craving. You will be choosing from 5 intense blends which include strong Arabica and Robusta beans, 4 espresso blends loved for their balanced flavor and complex notes, 4 single-origin coffees each carrying the distinct flavor of their homeland, 4 Italian lungo options which range from intense to light and sweet, 4 decaffeinated blends which manage to decrease caffeine without sacrificing flavor and lastly, 3 variations that interlace best-selling coffee blends with the flavor and aroma of caramel, vanilla and chocolate. Satisfactory Warranty – Nespresso guarantees the Prodigio for 1 year after the date of purchase. If your machine should require a repair during that time, Nespresso takes it upon themselves to pick up the machine at an address of your choosing, leave you with a loaner machine to use and then deliver the repaired machine in a timely manner. Limited Selection of Capsules– Only Grand Cru coffee capsules fit the Prodigio, which leaves using Nespresso’s VertuoLine capsules and capsules made by rival companies completely out of the question. Installing the App – Downloading and installing the Nespresso app, as well as pairing the Prodigio with your device, should theoretically be a simple process. Numerous users, though, have found that it sometimes requires multiple attempts and an extra dose of patience to complete the process successfully. 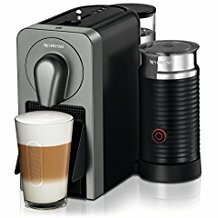 Price – Nespresso’s Prodigio seems expensive at first glance and you are required to pay extra if you want an integrated Aeroccino milk frother. Considering, though, that the Prodigio premieres Bluetooth connectivity and consistently delivers great espressos at roughly a third of the price that you would pay at a cafe, I would suggest that the machine is well worth the investment. In conclusion, Nespresso’s Prodigio offers many useful features and its strengths balance nicely with its weaknesses. Overall the Prodigio is a good option for those who thrive on connectivity and are seeking to save time and hassle.